Currently enjoying a "ravishing revival" on Broadway at the intimate Circle in the Square Theatre Once On This Island is the captivating legend of romance. Ti Moune, a peasant girl, rescues a wealthy boy, Daniel, from the other side of the island and falls in love with him. Unknown to Ti Moune, the pompous gods who preside over the island make a bet with each other over which is stronger, love or death, and the stakes are Ti Moune's life. When Ti Moune pursues Daniel, who has returned to his people, she is shunned because of her lowly status. Her determination and capacity to love is not enough to win Daniel's love, and Ti Moune pays the ultimate price. 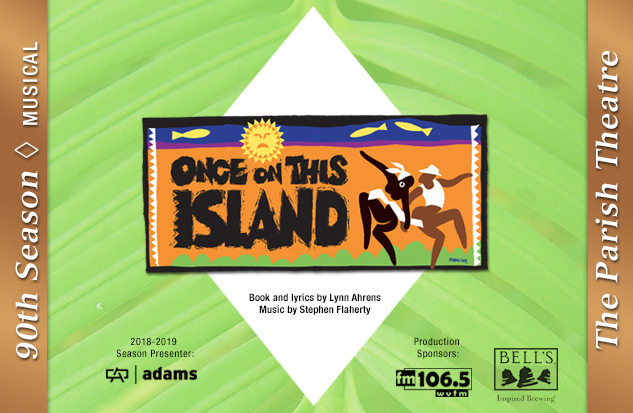 Once On This Island earned eight Tony nominations for its Broadway run, including Best Musical, Book and Score. Celebrate storytelling with this joyous Calypso-flavored tale of one small girl who finds love more powerful than the forces of prejudice, hatred and death. "...a joy filled Caribbean escape..."
Live flame and water based haze may be used in this production. Once On This Island is approximately one hour and twenty minutes long and is performed without an intermission.